Home Indonesia Angklung instrument What is that? The angklung is a musical instrument from Indonesia made of two to four bamboo tubes attached to a bamboo frame. The tubes are carved to have a resonant pitch when struck and are tuned to octaves, similar to American handbells. The base of the frame is held in one hand, whilst the other hand shakes the instrument. This causes a repeating note to sound. Each of three or more performers in an angklung ensemble play just one note or more, but altogether complete melodies are produced. The angklung is popular throughout Southeast Asia, but it originated in what is now West Java and Banten provinces in Indonesia, and has been played by the Sundanese for many centuries. Angklung and its music has become the cultural identity of Sundanese communities in West Java and Banten. Playing angklung as an orchestra requires cooperation and coordination, and is believed promotes the values of teamwork, mutual respect and social harmony. On November 18, 2010, UNESCO officially recognized Indonesian angklung as a Masterpiece of Oral and Intangible Heritage of Humanity, and encourage Indonesian people and government to safeguard, transmit, promote performances and to encourage the craftsmanship of angklung making. Another theory suggests that the word “angklung” was formed from two Balinese words – angka and lung. Angka means “tone”, and lungmeans “broken” or “lost”. Angklung thus means “incomplete tone”.The word “angklung” may have originated from Sundanese “angkleung-angkleungan”, suggesting the movement of the angklung player and the “klung” sound that comes from the instrument. According to Dr. Groneman, angklung had already been a favorite musical instrument of the entire archipelago even before the Hindu era. According to Jaap Kunst in Music in Java, besides West Java, angklung also exists in South Sumatra and Kalimantan. Lampung, East Java and Central Java are also familiar with the instrument. In the Hindu period and the time of the Kingdom of Sunda, the angklung played an important role in ceremonies. The angklung was played to honor Dewi Sri, the goddess of fertility, so she would bless their land and lives. The angklung also signaled the time for prayers, and was said to have been played since the 7th century in Kingdom of Sunda. In the Kingdom of Sunda, it provided martial music during the Battle of Bubat, as told in the Kidung Sunda. The oldest surviving angklung is 400 years old Angklung Gubrag. It was made in the 17th century in Jasinga, Bogor. Other antique angklung are stored in the Sri Baduga Museum, Bandung.The oldest angklung tradition is called “Angklung Buhun” (Sundanese: “Ancient Angklung”) from Lebak Regency, Banten . Angklung buhun is an ancient type of angklung played byBaduy people of inland Banten province during Seren Taun harvest ceremony. In 1938, Daeng Soetigna [Sutigna], from Bandung, created an angklung that is based on the diatonic scale instead of the traditionalpélog or sléndro scales. Since then, the angklung has returned to popularity and is used for education and entertainment, and may even accompany western instruments in an orchestra. One of the first performances of angklung in an orchestra was in 1955 during the Bandung Conference. In 1966 Udjo Ngalagena, a student of Daeng Soetigna, opened his “Saung Angklung” (House of Angklung) as a centre for its preservation and development. UNESCO designated the angklung a Masterpiece of Oral and Intangible Heritage of Humanity on November 18, 2010. In Bali, an ensemble of angklung is called gamelan angklung (anklung). 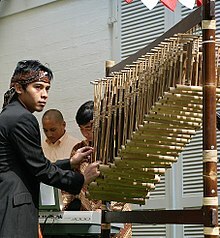 While the ensemble gets its name from the bamboo shakers, most modern compositions for Gamelan Angklung do not use them. An ensemble of mostly bronze metallophones is used instead, generally with about 20 musicians. While the instrumentation of gamelan angklung is similar to gamelan gong kebyar, there are several critical differences. The instruments in angklung are tuned to a 5-tone slendro scale, although most ensembles use a four-tone mode of the five-tone scale played on instruments with four keys. An exception is the five-tone angklung from the north of Bali. In four-tone angklung groups, the flute players will occasionally use an implied fifth tone. Additionally, whereas many of the instruments in gong kebyar span multiple octaves of its pentatonic scale, mosts gamelan angklung instruments only contain one octave, although some five-tone ensembles have roughly an octave and a half. The instruments are considerably smaller than those of the gong kebyar. Gamelan angklung is heard in Balinese temples, where it supplies musical accompaniment to temple anniversaries (odalan). It is also characteristic of rituals related to death, and therefore connected in Balinese culture to the invisible spiritual realm and transitions from life to death and beyond. Because of its portability, gamelan angklung may be carried in processions while a funeral bier is carried from temporary burial in a cemetery to the cremation site. The musicians also often play music to accompany the cremation ceremony. Thus, many Balinese listeners associate angklung music with strong emotions evoking a combination of sacred sweetness and sadness. The structure of the music is similar to gong kebyar, although employing a four-tone scale. Jublag and jegog carry the basic melody, which is elaborated by gangsa, reyong, ceng-ceng, drum, and flute. A medium-sized gong, called kempur, is generally used to punctuate a piece’s major sections. Most older compositions do not employ gong kebyar’s more ostentatious virtuosity and showmanship. Recently, many Balinese composers have created kebyar-style works for gamelan angklung or have rearranged kebyar melodies to fit the angklung’s more restricted four-tone scale. These new pieces often feature dance, so the gamelan angklung is augmented with more gongs and heavier gongs. Additionally, some modern composers have created experimental instrumental pieces for the gamelan angklung. Sundanese boys playing the Angklung in 1918. The angklung was first invented in West Java, Indonesia; with a possibility of cultural transmittance to various other places such as Malaysia & the Philippines over the course of several centuries. In the early 20th century during the time of Dutch East Indies, theangklung was adopted in Thailand, where it is called angkalung (อังกะลุง). It was recorded that angklung was brought to Siam in 1908 by Luang Pradit Pairoh, royal musician in the entourage of HRH Field Marshal Prince Bhanurangsi Savangwongse of Siam, who paid a royal visit to Java that year (27 years after the first state visit of his elder brother, King Chulalongkorn to Java in 1871.) The Thai angklung are typically tuned in the Thai tuning system of seven equidistant steps per octave, and each angklung has three bamboo tubes tuned in three separate octaves rather than two, as is typical in Indonesia. In 2008, there was a grand celebration in the Thai traditional music circle, to mark the 100th anniversary of the introduction of angklung to Thailand. Both the Thai and Indonesian governments supported to celebration. Angklung has also been adopted by its Austronesian-speaking neighbors, in particular by Malaysia and the Philippines, where they are played as part of bamboo xylophone orchestras. Formally introduced into Malaysia sometime after the end of the Confrontation, angklung found immediate popularity.They are generally played using a pentatonic scale similar to the Indonesian slendro, although in the Philippines, sets also come in the diatonic and minor scales used to perform variousSpanish-influenced folk music in addition to native songs in pen tatonic. Previous articleCamp Vietnam (Galang Island) what is that? Next articleSOTO what is that?